Kidnapping……every parents worst nightmare. 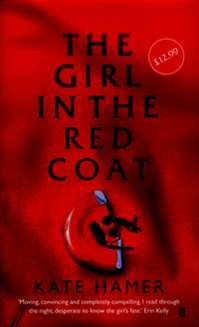 The Girl in the Red Coat by Kate Hamer is a gripping emotional roller coaster of a tale. Having children myself, this story probably hit a nerve more with me than if i had read it before i had children. Carmel is a missing girl but the problem is, she doesn’t know she is lost. Eight year old Carmel Wakeford becomes separated from her mum at a children’s book festival, and is found by a man who claims to be her estranged grandfather. He tells her that her mum has been in a fatal accident and that she is to live with him. Days turn into weeks and Carmel realises that ‘Granddad’ believes she has a special gift. Throughout Carmel’s ordeal, we follow the mothers heart-wrenching desperation as she trys to find her daughter and admire the determination she has to never give up looking for her Carmel. I won’t be a spoiler and give away anymore of the story away. I was gripped by this novel from the first page and i found myself turning on my kindle at every opportunity to read a few more pages. I give The Girl in the Red Coat an enthusiastic 4 star Dublin Mummy rating*.